Sometimes, if I let myself, I could feel it: that unspeakable force linking one to the other. A connection. A bond. Or maybe it was just me. We’d already fought together and bled together. That may not have made us friends, but it made us something. This story takes place a few short months after the end of Fate of Flames and we finally see Maia settling into her role as the fire effigy. With the other three girls, they’re finally starting to become a team. But betrayal comes from within their very organization and Phantoms aren’t the only monsters they have to face. For me, the thing this book does very well is the characters. I usually shy away from first person stories because so many times you don’t learn anything about the rest of the cast (and you learn way too much about the main character). It’s like they’re little satellites that revolve around the MC and have nothing else going for them. That’s not this book. While I like Maia, she isn’t even close to my favorite character. (Maybe fourth, depending on how much problems I’m having with Belle at the moment.) But she’s a likable main character. She’s taken to her role as well as I hoped she would after the struggle for her in the first book, and while she’s not as ‘tough’ as the other effigies, she doesn’t have to be to be strong. The other effigies are all important character, with their own struggles and histories, and we only get to see part of that here, but it’s so lovely. I adore that the most important relationship that Maia is building isn’t a romance, but the friendship between her teammates. Each of them are unique individuals and, because you have three headstrong girls, their teamwork isn’t always the best. However, the one thing stopping me giving it a higher rating (and I can’t tell you how much I wanted to) is the plot development. 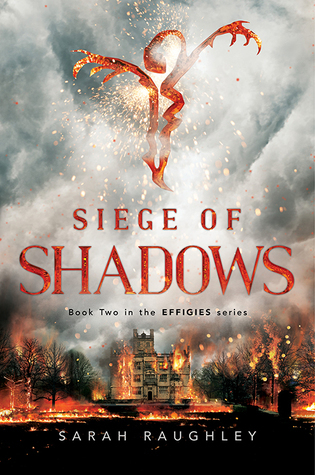 While I loved that the first book focused a lot on monster fighting, and I love that this book starts revealing more about the effigies, I have one problem. That being said, this is a solidly enjoyable book and a series I’m very happy with as a whole. Content Advisory: Uhh… yeah, maybe a few curse words – I’ve heard much worse in PG13 movies – but it’s a surprisingly clean book. There are some description of corpses and decomposition and the … insect effect that has on the human body. Also non-explicit/off-screen torture.